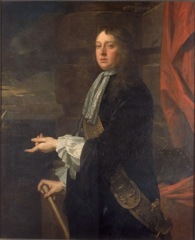 Born to a rich family in London, England, William Penn was the son of Sir William Penn (an admiral in the king's royal navy). His mother was very religious and taught him about God. Penn had a religious experience when he was twelve year old. Penn attended Chigwell Grammar School in Essex. He entered the University of Oxford in 1660, but was expelled in 1662 because he didn't want to follow their religion. HIs father sent him to the Protestant College in Samur, France and then he studied law for one year at Lincoln's Inn. William Penn decided that he did not want to be an Anglican anymore. He found a new religion called the Society of Friends, or the "Quakers." He liked their beliefs and, when he was 22 years old, Penn joined the Quakers.